Special thanks to Bryant for giving me a bottle of this wonderful ink. I like this ink, too. Quite simply, reliably blue. I really like this blue too. I find all the Visconti inks dry and a cure for medium wet writers. That Visconti blue looks good too. Decisions...decisions....You know what they say, "variety is the spice of life." Visconti is my favorite blue. Thanks for the review. Visconti blue is also my number one blue. Visconti Blue is also my #1 blue - great stuff, imho/ime. I do wish they would bring back the glass v-bottle instead of the plastic ones. I recently got a bottle of Visconti Blue and I have to say it appears much darker than what this review looks like. Is that normal? Are there variations between bottles? Lots of wants, limited funds! Depends a lot on the pen. I currently have Visconti Blue in a Pelikan 800 and a 1927 Parker Duofold Jr., both with fine nibs. The line produced by the Parker is considerably darker than that of the Pelikan because the vintage nib writes a wetter line. 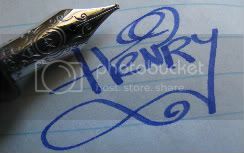 The Parker lays down so much more ink than the Pelikan, and consequently dries darker on the page. This is quickly becoming my favorite blue thanks to a friend on Pentrace. He kindly sent me a bottle for the ridiculously low price he found it at a local sale in Philadelphia. I have seen others make similar observations. I believe this darkening to be the case as well. The new blue I find in my plastic mushroom bottle is still very fine -- if indeed I am correct in saying a change has taken place -- but just not as luminous, irridescent, etc. as the earlier blue I find in my glass mushroom bottle. I would be interested in reading others' views on that point, though -- as my conclusions that the shade has changed -- those conlusions might not be accurate, and I may instead be dealing with an anomaly. I am using the same pen for comparison, though -- the same type of pen, as in two Phileases. Also, most recent re-fill plastic bottle also contains the darker shade. Some have speculated here at FPN that Visconti has changed the formula. This evidence causes me to wonder the same. As to the plastic mushroom bottle itself, that some of us objected to earlier, I have made my peace with it. Earlier this year, several dealers told me that Visconti was switching to the plastic vs. the earlier glass, which was slated for elimination. I am surprised to read that some have heard otherwise. I will follow that conversation with interest as well. Whatever the case there -- as to making peace with the plastic mushroom bottle, I find it to be practical on its bordered plastic base, within its clear plastic cover. I super-glued the bottle to the base, and it is a sturdy and reliable ink dispenser for me. No problems -- and, although plastic, attractive enough on my desk as it is. I enjoy using it a great deal. Even with the changes, I remain a Visconti Blue fan. Wonderful stuff. Am enjoying this thread. Thanks to all! I'm a devoted fan of blue inks. In my estimation Visconti blue ranks among the finest available. It strikes an almost perfect balance between vibrancy and bearing. I love Visconti Blue, it's wonderful in terms of colour and flow. True blue, beautiful color. One of the nicest inks out there, never praised enough and often not mentioned here. Outstanding product, shame the bottle changes. I agree. My favourite ink. I was looking for this ink at stores, but a sales lady told me they are getting rid of the plastic V bottles and going back to glass... is this true? Because that would bring ink prices up... and I certainly don't want to order this one just by looking at scans. If you don't want to shell out for the V Bottle (they're expensive, and if they're not made of glass they're just not worth it), you can buy a plastic 50 mL bottle for about... $7, if I can remember correctly. You should get the ink! I was apprehensive about it too, and didn't want to buy it, but a bottle came with my Visconti Wall Street, and I'm regretting not buying the ink before they sold out of the glass bottles.